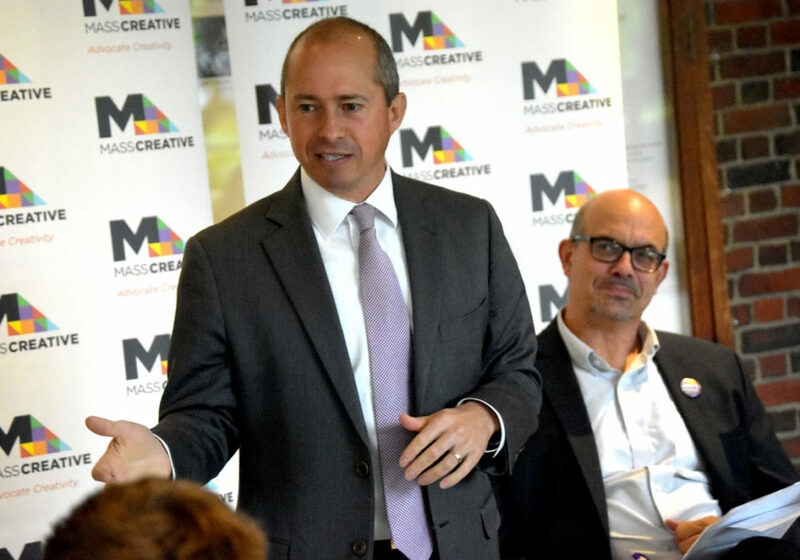 At the end of a “Create the Vote” candidate forum Monday with Jay Gonzalez—the Needham Democrat running against Republican incumbent Charlie Baker for governor of Massachusetts— Melissa Nussbaum Freeman of Red Sage Stories Playback Theatre & Art for Social Change said she’d not heard Gonzalez mention anything about paying artists. “I barely make a living. I took my social security early. I get food stamps. I live in an apartment with three people in Dorchester,” she said. Gonzalez said most early education providers in the state made $25,000 per year and that 40 percent of them receive state assistance. About 50 people attended Monday morning’s forum at Harvard University’s American Repertory Theater in Cambridge, which was organized by the statewide arts advocacy group MassCreative. 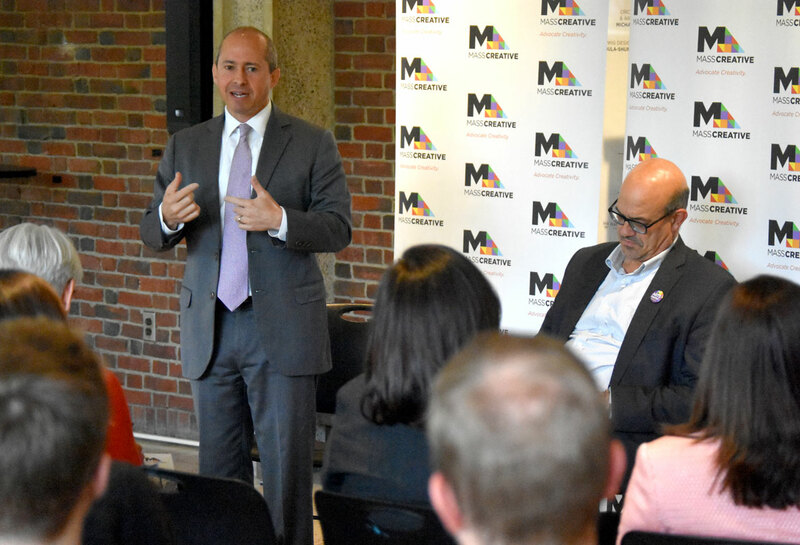 Matt Wilson, executive director of MassCreative, who moderated the event, said Monday that the group had invited Gov. Baker to take part in his own solo “Create the Vote” forum, but the governor hadn’t yet responded. “I don’t have a creative bone in my body,” said Gonzalez, who was Secretary of Administration and Finance of Massachusetts under Gov. Deval Patrick, then worked as president and CEO of CeltiCare Health and New Hampshire Healthy Families. He reminisced about his father playing songs from his native Spain as Gonzalez was growing up in Cleveland, a brother studying at Berklee College of Music and playing at Passim, a daughter excited by graphic design in high school, a grandmother-in-law who enjoys an arts program for seniors. Gonzalez said he supports increased education funding and early childhood education—including more funding for arts education. “I understand the governor has repeatedly tried to cut funding for the Mass Cultural Council,” Gonzalez said. “I will not make it worse and I will try to make it better. I will add more to that.” He said he supports increasing the state’s cultural facilities improvement fund. He said, if elected governor, he would ask the state Executive Office of Health and Human Services to look at how it could incorporate the arts into their programming. Gonzalez spoke of his proposal to raise taxes on wealthy individuals and institutions to fund education and transportation programs—including a new 1.6 percent tax on the endowments of universities with more than $1 billion in their endowments. Harvard and Boston University would be among those affected by his proposal. Gonzalez said the new taxes would not reduce what these universities are able to do because the endowments have seen 4.8 to more than 8 percent growth per year. Are you interested in politics and the arts? Then have we got a publication for you: Wonderland! Help Wonderland keep producing our great coverage of local arts, cultures and activisms (and our great festivals) by contributing to Wonderland on Patreon. And sign up for our free, weekly newsletter so that you don’t miss any of our reporting.